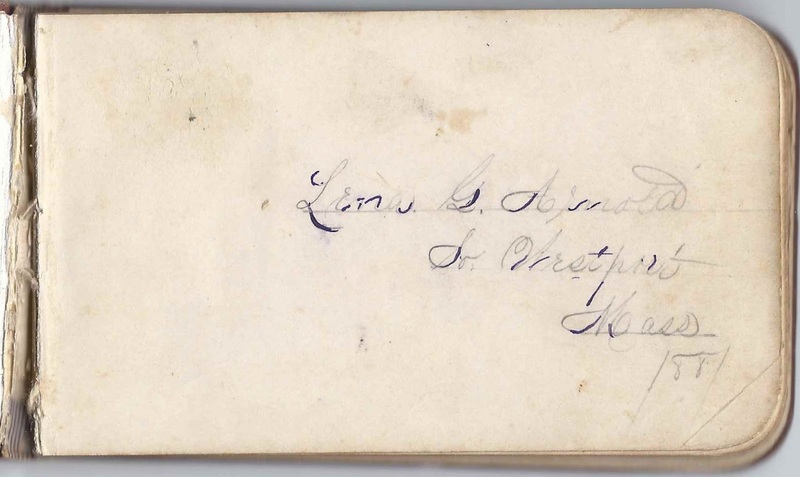 1880-1897 autograph album that belonged to Lena G. Arnold of South Westport, Massachusetts. Lena married Herbert A. Brightman of South Westport, Massachusetts, in 1886. 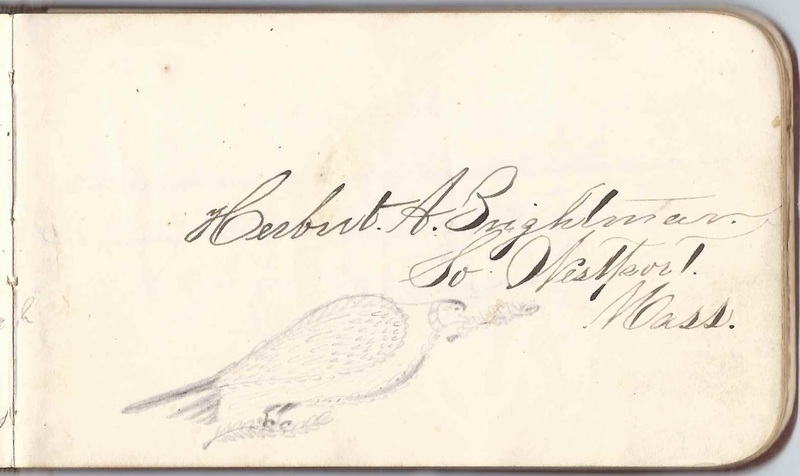 He signed two pages in the album, at least one of them well before their marriage, unless what looks like 1881 is actually 1887. 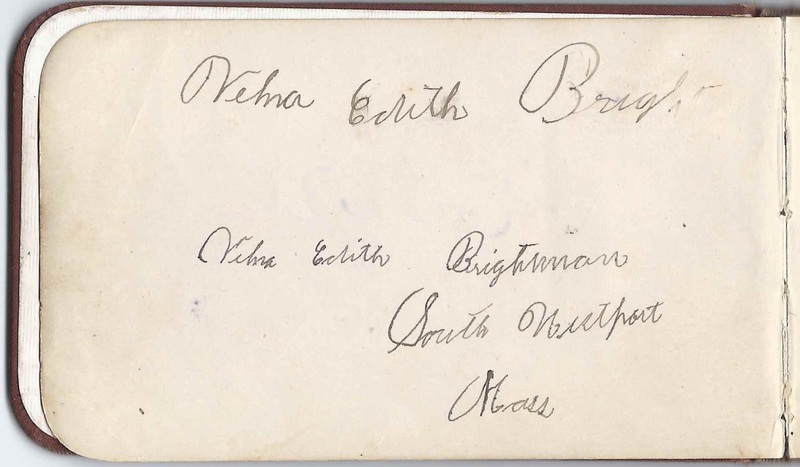 Their daughter Velna Edith Brightman of South Westport, Massachusetts also signed two pages in the album, one signed March 12, 1897. 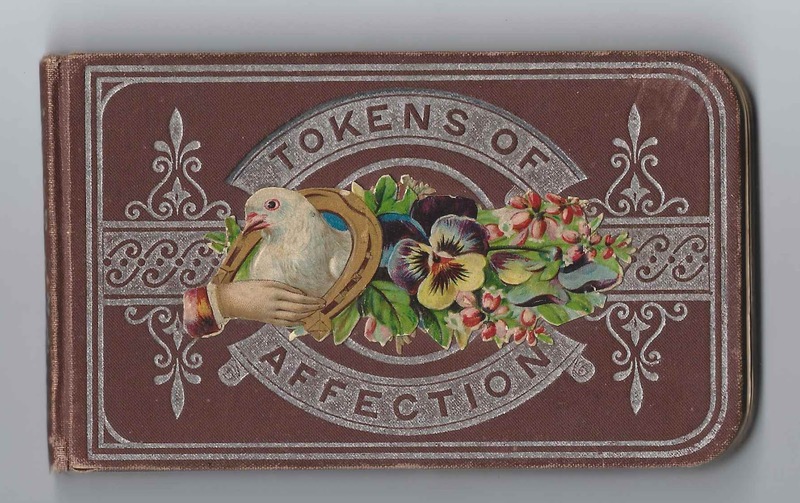 The album measures approximately 5" x 3" and contains the sentiments of nearly 70 of Lena's relatives and friends. An alphabetical surname list and an alphabetical list of signers, with any included personal information, appear at the end of this post. Lena G. Arnold was born about 1865 in Rhode Island, the daughter of Thomas and, possibly, Mary A. (Clark) Arnold. She may have been the Arnold child born at Providence, Rhode Island, on 3 January 1875, to parents Thomas A. Arnold and Mary A. Arnold, according to an entry in the Rhode Island Births and Christenings 1600-1914. I wonder if Mary was Mary Amey; if so, she might have been the mother of Lena's older sister Clara I. Arnold, born 20 May 1858 at Providence, Rhode Island. Sadly, Clara died young on 20 April 1891 at Westport, Massachusetts. There's a Rhode Island marriage record for the marriage of Thomas A. Arnold and Mary D. Clark at Providence, Rhode Island, on 26 December 1868. Assuming this was Mary D. Clark's first marriage, her parents, according to the record, were John F. and Catherine Clark. Either Lena's mother had died or she was born before her parents, Thomas A. Arnold and Mary D. (Clark?) Arnold were married. As noted above, on December 25, 1886 at Tiverton, Rhode Island, Lena G. Arnold married Herbert A. Brightman. Herbert was born 24 March 1861 at either Westport, Massachusetts, or Taunton, Massachusetts; there are records for both. On the record indexed as Taunton, but appearing to be Westport, he's shown as the illegitimate son of Phoebe A. Boardman. Several other people named Brightman signed pages in the album; refer to the list of signers below. Lena G. (Arnold) Brightman and husband Herbert A. Brightman may have had only one child, the daughter Velna Edith Brightman as mentioned above. They lived at Westport, Massachusetts. Clara I. Arnold, signed on August 20, 1881. Lena's older sister. Velna Edith Brightman of South Westport, Massachusetts. She was the daughter of Lena G. (Arnold) and Herbert A. Brightman. She signed another page as well. 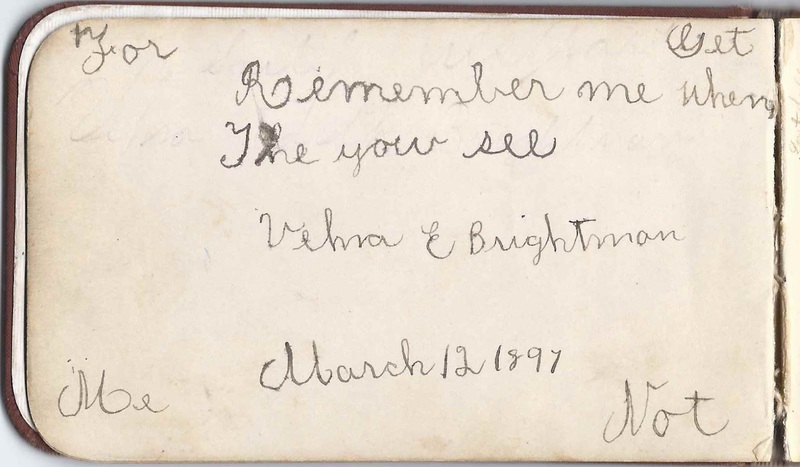 Velna E. Brightman, signed on March 12, 1897; she was the daughter of Lena G. (Arnold) and husband Herbert A. Brightman. She signed another page as well. Herbert A. Brightman of South Westport, Massachusetts. He sketched a pigeon. Became Lena G. Arnold's husband on 25 December 1886. 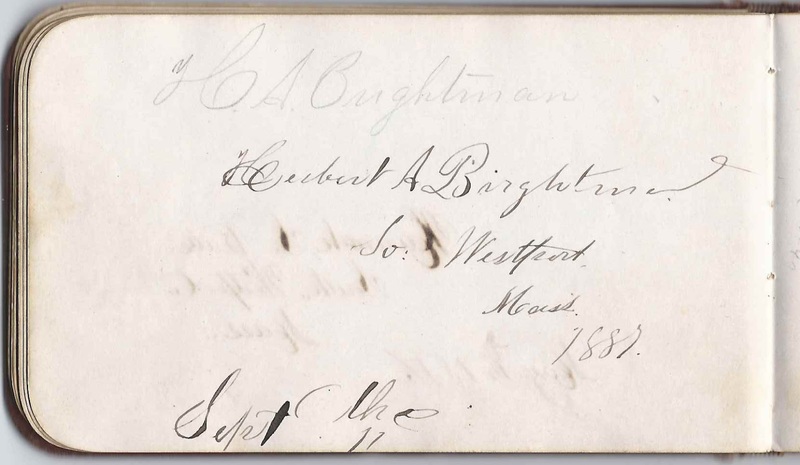 A. Ella Brightman of Dartmouth, Massachusetts, signed on November 13, 1881. 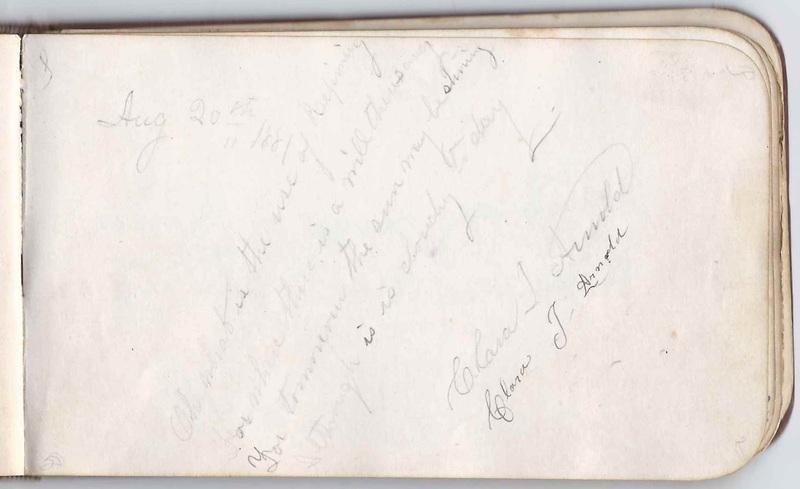 "Born July 11, 1864"
May A. Gifford of South Westport, Massachusetts, signed on March 25, 1880. Later note: "Died March 6, 1885. Gone but not forgotten"
Mamie E. Head of Adamsville, Rhode Island, signed on August 17, 1881. Adamsville is a village in Little Compton, Rhode Island. E. A. Manchester, signed on September 19, 1883.
? J. Mugford; possibly Anne or ? Albert S. Thomas of North Dartmouth, Massachusetts, signed on June 9, 1882. Mentions George Thomas house.